See on pilt, mis oli postitatud eile Facebookis ühe hea kodaniku poolt ja on saanud juba 12000 jagajat. 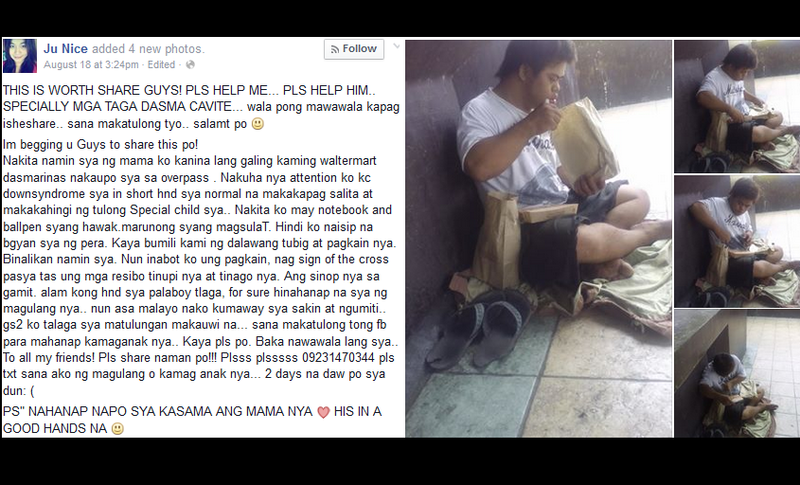 Ju Nice posted this picture of a man with a down syndrome that was seen near Walter Mart in Dasmarinas, Cavite. This man was said to be seen there for 2 days and since he has mental disorder, he can't speak well and ask for alms. Ju Nice saw that he knew how to right. They gave him water amd food instead of money. He was so kind and do the sign of the cross after they gave him food. He waved and smiled at them when they walked away. As of now, Ju Nice confirmed that the man was already found by his family because of her post in facebook. This showed that people who are mentally impaired should receive more attention and care because they can't think well. We should admire people like Ju Nice for doing good deeds and this might serve as an inspiration to others to help those who are in need. Helping people is our ways! SHARE and don't forget to leave a comment!